Cinders is an independent production being a graphic novel. The game is loosely inspired by the fairy tale of Cinderella and tells the stories of four women who have to make difficult decisions affecting their future. The Polish studio MoaCube is responsible for the title. 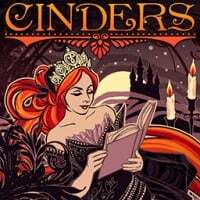 Cinders is an independent video game which is a graphic novel inspired by the fairy tale of Cinderella. It is produced by a small Polish studio MoaCube, founded by Tomasz Grochowiak and Gracjana Zielinska. The plot focuses on presenting the fate of four women, of which the main character is Cinderella. The title is only inspired by a cult fairy tale, and history and all characters are very different from the original. Cinderella is not a wronged and clumsy girl, but a conscious and confident woman, who, together with other heroines, encounters various problems on her way. It is therefore a fairy tale for adults, about respecting the other person, getting to know their goals and motivations. The game is mainly based on reading the text displayed on the screen, drawing conclusions and making moral choices on their basis, which occur very often in the game Cinders. The authors have prepared about 300 possible decisions, which should be made in 120 situations. These are not dry numbers, because depending on our actions, the plot of the story told in the production changes. The visual setting consists of gently animated, fairy tale images that change depending on the scene currently displayed. Thanks to this, the game looks nice and at the same time there are no excessive graphics requirements. What we see on the screen was made almost entirely by Gracjana Zielinska. The founder of MoaCube studio, Tomasz Grochowiak, previously worked in CD Projekt RED, while Gracjana Zielinska is an artist who made illustrations for companies such as Corel, Ballistic Publishing, Harper Design or Avantura Studio.